The last couple of years have presented more changes and moves for the Brown family. We are very happy to be back in Temeculah, California where we're enjoying being close to extended family. I have several clinics booked for 2015 and a number of horses in training. Check back soon for more updates! 2013 started out with a lot of new changes in my life. My husband and I relocated to the Seattle area from Texas and I had my second child in April, another boy, who we named Sawyer Jay Brown. A foal out of my good cow horse mare was born, a bay colt sired by BHR Frenchies Socks and I bred Sol Olena back to Dash ta Fame. I returned to riding during my June clinic in Kansas and enjoyed instructing several more clinics that year. 2012 was a very busy year for me as I balanced running at futurities with my new son and I relocated to Washington State after BFA in December. I started out the year running in February at the Lance Graves ProClassic Futurity- there I ran Kiss Jet Goodbye to 6th place in the Slot Race and WR Special Fame to 15th place in the average at the BFA Futurity. May was an outstanding month for me as VF Elmers Lil Sis came back from injury to compete again together. Our very first run back in over a year, we set a new arena record at the Diamond T arena in Denton, TX. I ended up taking her and WR Special Fame to the Fort Smith Futurity, where both qualified for the finals and both ended up 13th. I spent most of the summer hauling my two outstanding juvenile prospects, Bratwheresmysocks and Toast ta Hollywood B, to jackpots all around north Texas getting exhibitions on them. At the CC5D in Stephenville, Lil Sis and I won the Derby competition and finished 3rd in the 1D behind Epic Leader- that would end up being our last competition together as she reinjured her leg and needed the rest of the year off. At the Jud Little Futurity, my two three year olds ran nearly identical times in exhibitions, and were within a .5 of NFR Qualifiers. I was really looking forward to running them at BFA when I found out that I was expecting a new addition to my growing family. I decided to run Toast ta Hollywood B at the Slot Race and in the Juvenile while Bree went to another trainer to start her career. In my final appearance as head trainer at Shoppa Ranch, I placed 4th in the first go of the Juvenile Futurity but knocked in the second to place high in the average. 2011 was an exciting year for me as I my husband and I welcomed a new addition to our family- our son Jack Walter Brown. I took most of the spring off and came back competing at the Jud Little Futurity in September. All through spring and summer, I coached Kristin Shoppa in her last year of youth competition. 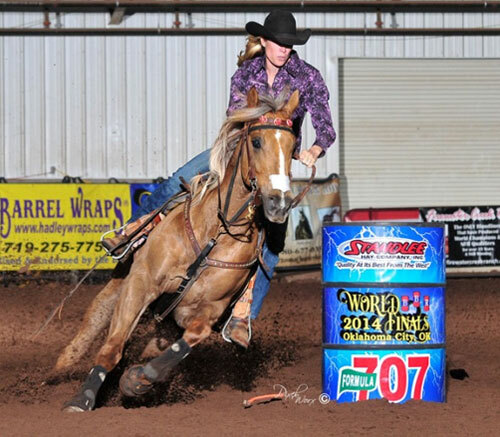 She finished very strongly, winning the Region III Barrel Racing title for the THSRA, finished second in the state of Texas at the THSFR, and qualified for Nationals, where she ended up 31st in the average. Then, in August, she ran at the AQHYA World Show and had a spectacular ending to her youth career. She qualified all three horses back to the finals- Prince of Perks, Bountiful Bootie and Cee Bar Tamulena. Kristin ended up winning the world on Prince, second on Bootie, and 7th on Boomer. Now, we are both AQHA World Champions! I ended the year running at BFA- I qualified Titan back for the finals and ran Kiss Jet Goodbye in the Juvenile & Slot Race.